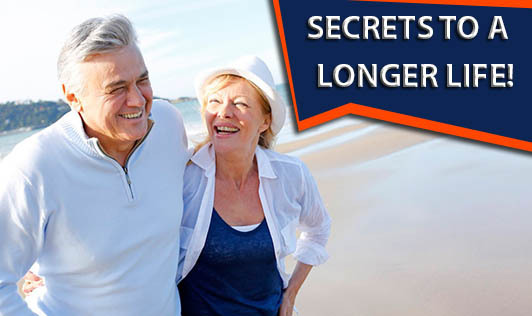 Secrets to a longer life! Do you want to live a longer live? Living a longer and healthier life isn't as difficult as most people think. Following strict diets and gym routines can be quite overwhelming. One has to view health as a new lifestyle and not as a chore. Longevity isn't just about physical health; it includes your emotions, relationships and intellect. • Go outside and do something fun. It's important for you to get at least an hour of mild exercise every day. Schedule fun activities with friends and family. • Be happy as it can have a great impact on your lifespan. A study by the University of Kentucky showed that people who are happy live at least a decade longer as compared to those who are unhappy. • Find a hobby that you enjoy. • Find opportunities to meet new friends and spend time with people you care about. • Make it a point to eat well every day. • Get yourself a pet, preferably a dog. • Laugh! It boosts your immune system, kills stress hormones and stimulates killer-T cells which fight cancer. • Help others, as studies have found that those who helped others experienced less depression, fewer pains and better health. • Give up smoking as it shortens your life and also lowers the quality of life in old age making you more susceptible to debilitating illnesses. • Lastly, believe in something. Studies have found a link between faith and living longer. Having strong beliefs helps people deal with emotional problems and stress and also offer protection against digestive, heart and respiratory problems. Don't just focus on living longer, focus on enjoying your life more than ever!